Dear friends, a number of you have asked what’s been happening for me the last five weeks. Some of you will know I’ve had pneumonia along with fractured ribs during this period, and I feel to share the inner journey of this dis-ease, as it may resonate for the healing paths some of you are also taking. Five weeks ago, an ‘atypical pneumonia’ had spread through members of my family, including my son. I hadn’t had a virus for years, but actually felt the moment it ‘jumped into my system’; I became worried about my son, who went to hospital with severe breathing difficulties, and my vibration dropped, opening a doorway to negative energies. Three days later, with my inner balance – and therefore outer balance – shaky, I slipped and fractured several ribs. The combination of heavy coughing and cracked ribs during the next few weeks was complicated by a larynx spasm that shut the windpipe, making my body go into stressful methods to get breathing again. The muscles around the damaged ribs would spasm, and go into cramps for hours, trying to compress and protect the ribs. This combination made it impossible to breathe, until I started to black out, until an adrenalin surge would block the pain and kickstart the breathing reflex. While this was happening on the physical level, I knew it was imperative to hold a high frequency focus, stay in love and peace, very deeply, and acknowledge, clear and heal the part of my small self caught in imbalance. I’ve been blessed with an enormous amount of help and support through this process, and here especially want to thank my Higher Self and higher soul aspects, my beloved Twin Flame, star family and guides, friends and family who have given guidance, comfort, support and healing both energetically and ‘on the ground’ (thanks to my beautiful Mum, I’ve been able to stay at home through most of this time). I knew the combination of a soul aspect of late Atlantis with some stored grief of this lifetime whose energies were vibrating in this Now, not in alignment with the inward spiralling Whole self, within the love-embrace of Higher Self and Source. I had done much healing and releasing with these aspects before, yet at a deeper core level they were still there and resisting the overall ‘keying up’ of frequencies (ascension). Just before this dis-ease state came in, I asked Source to bring to light and clear any last parts of myself that were resisting full ascension; in other words, I could feel something still blocking in the subconscious level, and Source answered, immediately! The small self part of my Now self connected to unresolved Atlantean energies, said: ‘You couldn’t hold the high vibration then. What makes you think you can do it now?’ From within that viewpoint, dying out of physical seems ‘better’ than risking the pain of falling out of a higher vibrational state (again). Through the healing and unblocking now taking place with these wounded soul aspects, immersed now in Love, the deeper openings are truly wondrous, taking me into a far more free, whole intimacy with my Higher Self, back into Source itself through the trail of incarnations through Universes, feeling the sweetness of the merging of all, reflected in, and twined with, the beautiful energies of reunion with my Twin Flame, and bringing that into the heart grid of Gaia as an uplifting, imprinting stream of light, memory and unity. The contrast of small self’s resistance has been there, reflected perfectly in physical, where new fractures have appeared in the lower ribs these last few days, from the muscle spasms. So this morning I asked my Higher Self, what is this last denying part, that is still ‘breaking away’? Higher Self and Twin Flame showed me the form of a great spiral funnelling INward, where the outer rings of the spiral represent 3D, and the rings going INward represent higher and higher frequencies. In my subconscious, a part of the 3D small self clings to the outer rings for dear life (but it’s perception is inside-out), in fear that it will be destroyed if it lets go and allows itself to be drawn into the centre. In the body, the spiral is symbolized by the outer rings as the ribs, outer protecting layer around the lungs, wherein the breath of life flows through to heart centre. The key in all healing journeys is to be at peace, unconditionally, with what is, so that the space is created for what can be, to take hold and bloom. That space is the restoration of love, all the way IN to Source, and it is golden. 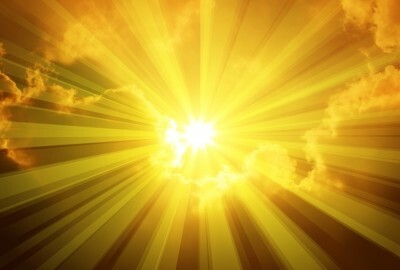 As Sananda says: ‘Make your body (and being) a reservoir of the golden flame’. Finally, I’d like to share with you some exquisite symbolism that appeared in the sky in the middle of this process. In it is a cradling hand, or ‘stairway to heaven’: the beautiful steps the small self builds to Ascend, and the sublime movement of Higher Self/Sun as it descends, to meet and merge ‘in the middle’…. 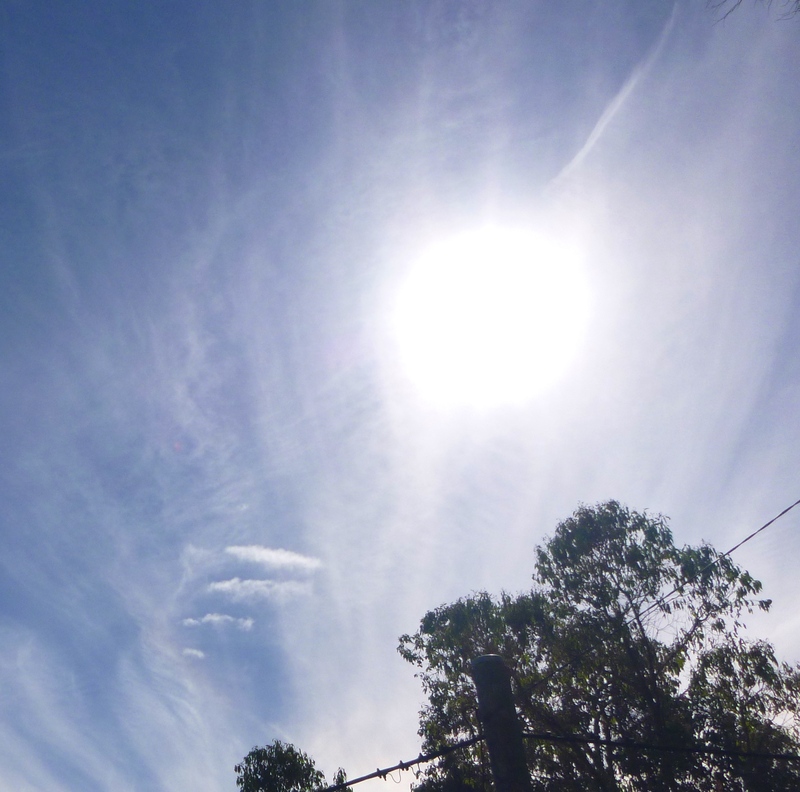 Photo taken on April 16th, 2014, Darlington, Western Australia, cradling hand and profile face, energies of Sesherat and Isis. PS: One addition to the photo above: what appear as steps are also the fingers of a hand, and if you look closely, you can see the whole hand delicately outlined, and a face in profile above, to the left of the Sun. One friend saw this as a being cradling me close, with their hand tenderly around, and I see a child’s face above the hand and close to the chin of the being’s face. This represents both the Higher Self cradling the soul aspect I spoke of above, and also beautiful Great Mother energies from Sirius. There is a composite of energies in this form, but I feel both Sesherat/Seshat and Isis strongly….who knew Egypt and Atlantis well…..and my Twin Flame….thank you blessed ones. This entry was posted in Angels, Ascension, Dimensions, Isis & Sesherat, Jesus Immanuel Sananda, Sky Signs, Twin Flames & Twin Souls, Uncategorized and tagged fifth dimension, guides, healing, higher self, Isis, Sananda, Sesherat, soul, star family, symbolism, Twin Flames by Joanna. Bookmark the permalink. Your experience is humbling, Joanna. My goodness what a struggle…yet now you have nearly ‘conquered the beast’ so to speak. It certainly clarifies exactly how powerful the releasing process truly is. Appreciate your willingness to share this experience, which definitely helps me on my path, Blessings. Namaste.